Mr. Sergei Gavrilov, President of the Interparliamentary Assembly of Orthodox and chairman of the State Duma Committee on civil society and issues of public and religious organizations, met with the Primate of the Orthodox Church of Cyprus. Discussed at the meeting that took place at Limassol were burning problems of the violation of the rights of Christians in the world in general and at the Middle East in particular. Also discussed was the inadequate condition of many Orthodox churches and monasteries in the territory of Northern Cyprus. Pressure being by political leaders of certain countries brought on bishops, clerics and laypeople was noted in particular. 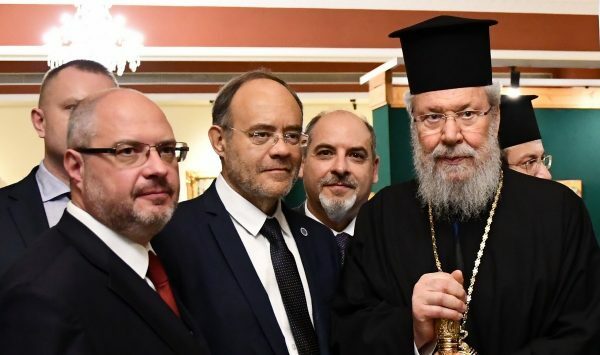 “We know that the Church of Cyprus stands for inter-Orthodox dialogue on the situation in Ukraine where civil authorities are interfering in church affairs. We are grateful for the support,” Mr. Gavrilov said. He called the upholding of human rights and protection of Christians against discrimination a major direction of activities in the current context. He added that the Russian Orthodox Church was engaged in actions of defending human right to free profession of their faith and the keeping of spiritual and moral values by supporting disabled persons, orphans and elderly people. The Russian Church conducts educational and peace activities which is aimed at the countering of attempts to instigate extremism under the guise of ethnical or religious slogans. His Beatitude Archbishop Chrysostomos I of New Justiniana and All Cyprus appreciated this kind of activity. The importance of developing pilgrimage to the holy sites of the Orthodox Churches of Russia and Cyprus was underscored.